First came the cocktail. A "pumpkin harvest" courtesy of the LCBO magazine. Normally I am not a fan of creamy drinks but it tasted mostly of spiced rum and the little froth that formed on top from the whipped cream was great. Next came the main course. 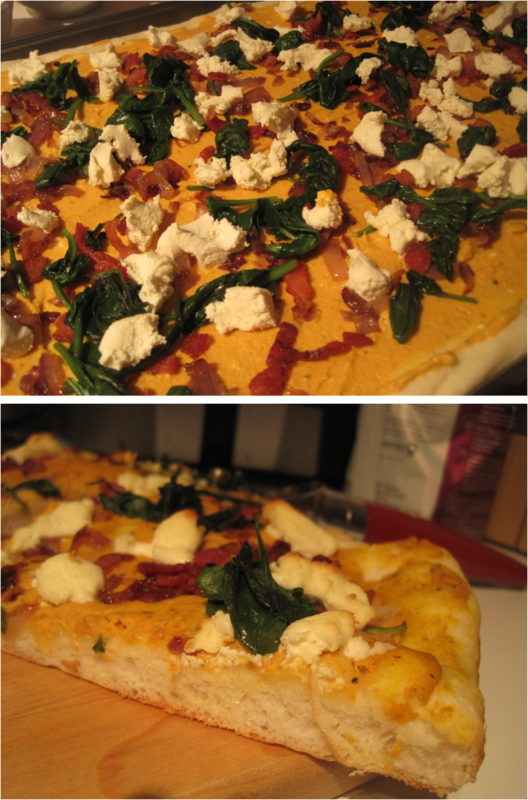 I had the idea of swapping out pizza sauce for pumpkin puree and added some cream cheese for extra creaminess. The toppings were stolen from a delicious pumpkin pasta recipe that my sister once gave me: bacon, wilted spinach, caramelized red onion, and chevre. Paired with a homemade pizza crust it was amazing! Place all ingredients into a cocktail shaker filled with ice. Shake sharply and strain into a cocktail glass. Garnish with a cinnamon stick. This one is pretty self explanatory. To make the sauce, blend pumpkin puree with room temperature cream cheese, and salt and pepper to taste (I may have splashed in a little balsamic vinegar). Spread on pizza crust. Distribute toppings evenly. Bake in a preheated 500C oven for 10-15 minutes depending on the crust thickness. This is one HOT oven!! 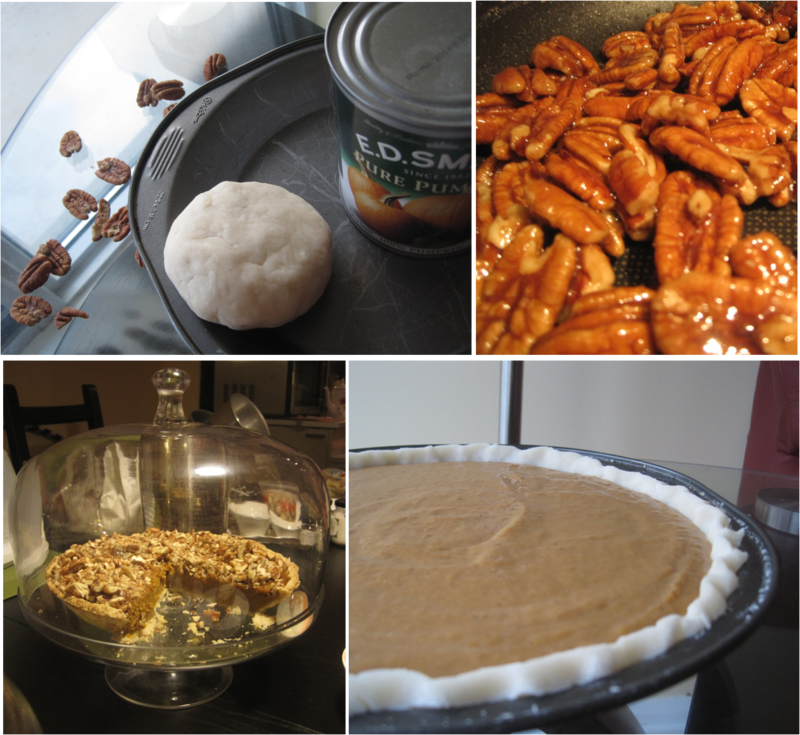 Place approximately 2 cups pecan pieces onto a non-stick frying pan over medium heat with 1/3 cup maple syrup. Heat until pecans are toasted and syrup caramelizes (about 3 minutes). Seriously, it's that easy! 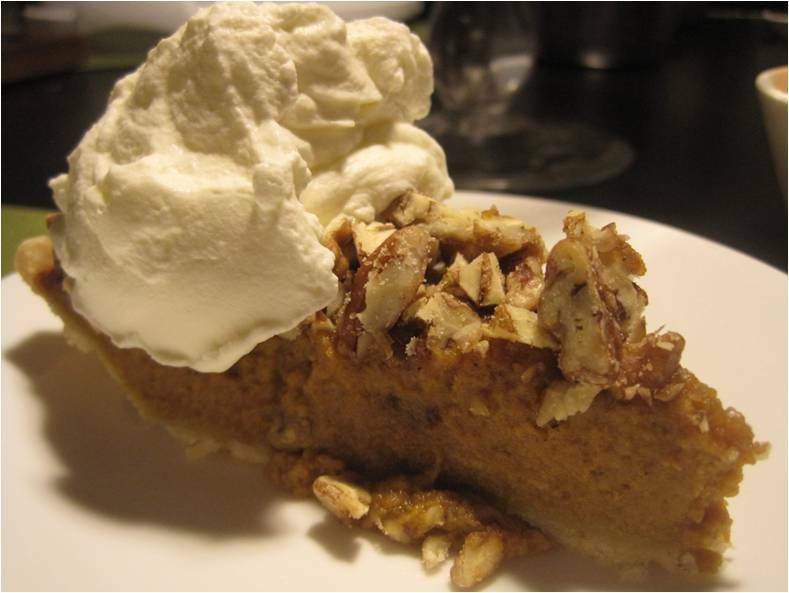 Top your favorite pumpkin pie, or vanilla ice cream... or just pop in your mouth as a snack!